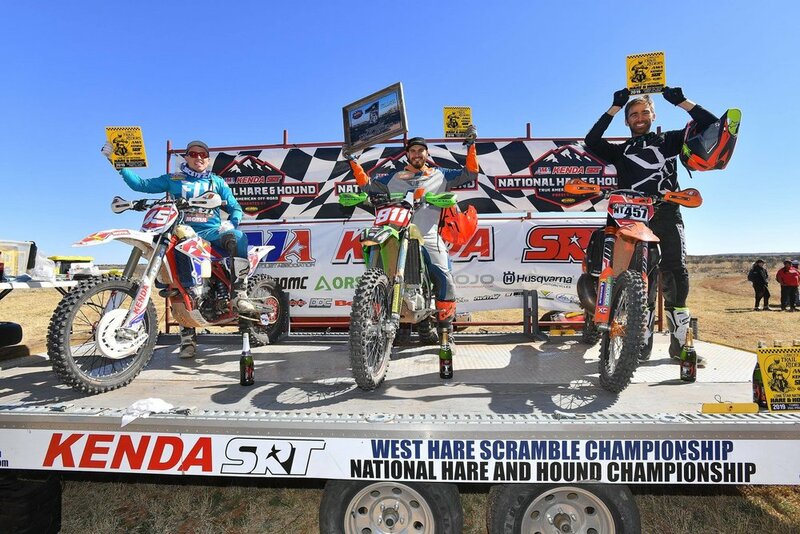 Kalgary, Texas - The second round of the National Hare and Hound series took place near Kalgary, Texas and Gnarly Routes rider, Cole Kirkpatrick attended the event looking for redemtion after running out of fuel last year while battling for a podium position. Kirkpatrick battled with Kendall Norman off the start on the bomb run for the holeshot but was edged out by Norman and ran second early on before fading back to seventh on the high speed first loop. Kirkpatrick would mount a charge on the second loop and work his way up to fourth place, passing Dalton Shirey, Chance Fullerton, and Ricky Brabec on loop 2 before a brief wrong turn would give Fullerton fourth place just before loop 3. Kirkpatrick would run down Fullerton about ten miles into the third loop and finally made a pass on Kendall Norman to take over third position twelve miles from the finish. Kirkpatrick would finish the day 3rd overall and 1st in 250 pro, his first national event podium since 2008!